Fall continues to delight the soul and inspire recipes that are warm and comforting for the season. So this recipe take quite a few ingredients and steps but its worth it. I have added the flavors of Fennel and Dry ginger to bring in the Kashmiri influence. This recipe is vegan but you could add fresh cream instead of coconut milk if you like. Lauki or Bottle Gourd is a staple in Kashmir but you can use Zucchini as an alternative. Take the grated Lauki and immerse in boiling water for 2 mins. Drain well and squeeze out the water. Mix together all the ingredients for the Koftas. Adjust the flour to get a good light consistency. Make moderate size balls and let them rest. Now you can deep fry these, bake them or use the pan I used, a good quality Takoyaki pan that has uses in multiple cuisines. Takes a dash of oil in each cup to cook the veggie balls. Make sure you rotate them to cook evenly. Once the batch is fried, let them rest on a towel until the sauce is ready. 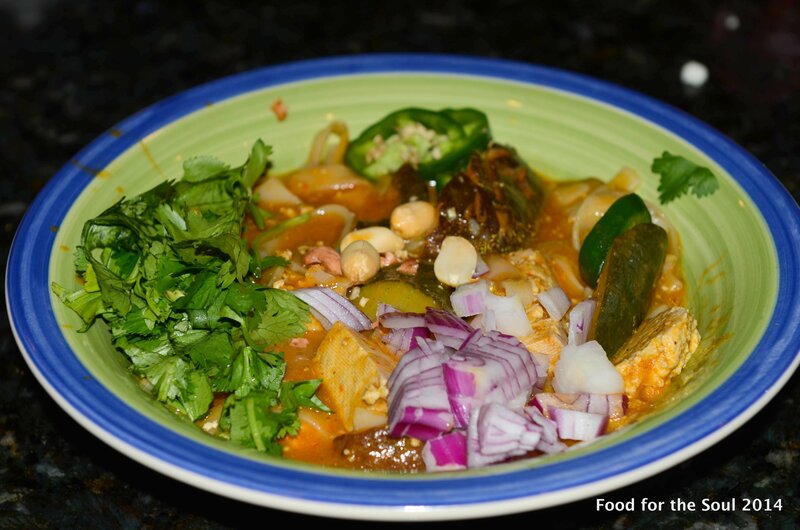 Blend the cashews, onion, tomatoes and green chili. Add olive oil to a pan, sprinkle the Cumin seeds and Fennel seeds. Add garlic and ginger paste and fry for a minute until fragrant. Add the dry ginger powder, fennel powder, cardamoms, cinnamon, turmeric, garam masala and the red chili. Add a cup of water and the coconut milk to the mixture and bring it to a saucy consistency. Add the Koftas and cook on medium heats for 5 – 10 minutes. Top with some fresh lemon juice and chopped chilis and serve with rice or naan. Sometime the simplest of dishes bring the most comfort. 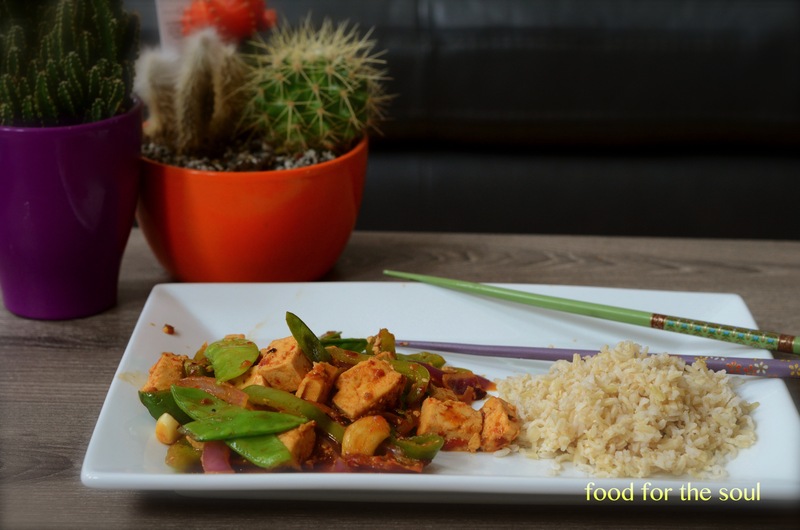 An effortless stir fry to clean out your fridge is how I would qualify this dish. After a long’s day at work it does feel good when you can whip up dinner 10 mins and it is completely satisfying and healthy. 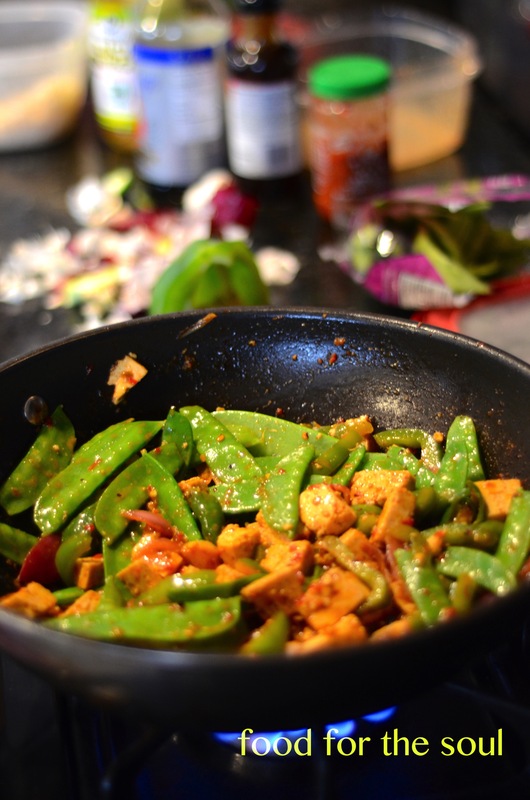 Any firm vegetables of your liking are good in the stir fry such as green beans or asparagus. For the tofu, I cut it in cubes and let it dry on a kitchen towel. The texture is firmer and better when it has less moisture in it. I like my garlic fresh and whole cloves but please chop if you like. For prep you want to chop all the veggies and set aside. Mix all the wet ingredients and set aside. 1/2 cup vegetable stock or water. Heat your wok on high until smoking. 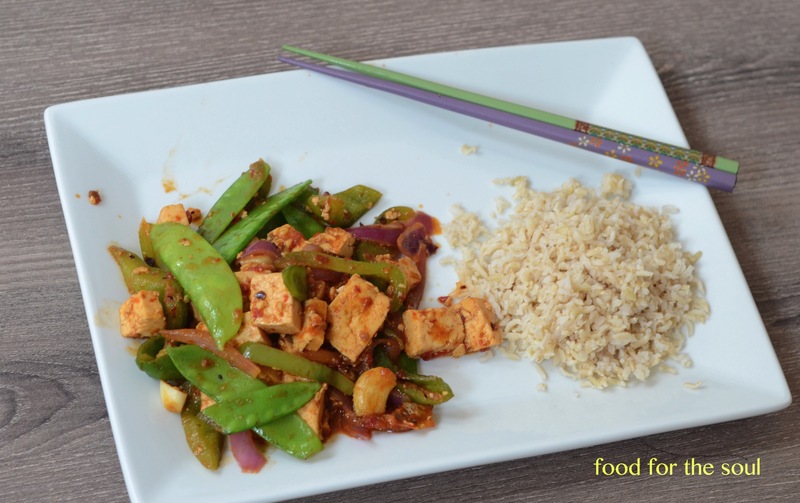 Add peanut oil and then the peanuts, give it a minute and add garlic cloves and green chili, let the garlic brown just very slightly and then add the tofu, add the veggies one at a time while stirring constantly being careful not to break up the tofu. Add the sauce and cook on medium heat for a couple of mins. Add sesame oil towards the end for that wonderful fragrance and taste.